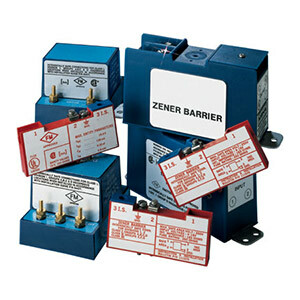 For most non-voltage producing devices located in a hazardous area, a single zener barrier that is negative-earth-grounded can be used for intrinsic safety. Instrumentation that produces an output (signal conditioners) usually requires two barriers, one for each "floating" lead. Here, a dual-channel barrier can be provided or for applications in which the instrument signal return level cannot be reduced, a supply barrier and a low resistance return barrier can be supplied. Approvals: UL, CSA Classes: I, II Divisions: 1, 2* Hazardous Location Group D * Certified by CSA for mounting inside a suitable enclosure in Div. 2 or non-hazardous locations and must be connected by means of the two studs provided to a grounded copper busbar or equivalent.